Welcome to Egmond aan Zee in the Netherlands! Pharmaceutical care is the pharmacist’s contribution to the health of individual patients. In addition to compounding and dispensing medicines, providing comprehensive pharmaceutical care has become the main activity of the profession. Pharmaceutical care is the care of the pharmacist, that aims to support the patient in his optimal medication use, in order to improve individual health outcomes. This implies that the medication provided must fit each patient in the best possible way. However, individual needs vary and not all patients need the most extensive form of pharmaceutical care. Consequently, simple and feasible methods are needed to target those patients that will benefit most from tailored pharmaceutical care. Both processes, targeting as well as tailoring care need an efficient organisation. - Which tools have to be developed to assess the pharmaceutical care needs of individual patients? - How can existing tools be optimized to target patients and to tailor pharmaceutical care for the individual patient? - How should such tools be implemented in daily hospital and community pharmacy practice? Apart from the lectures, five workshops were held. Each workshops lasted approximately 12 hours. This gave participants the possibility to be really creative, and reach for results that can be used in their own research. One workshop was more educational, and aimed at starting researchers and dealing with methodologies for research and aspects around obtaining funding. The Oral Communication Award of the Förderinitiative Pharmazeutische Betreuung was won by Fatma Karapinar (OLVG Hospital, Amsterdam, the Netherlands), with her presentation about 'The effect of a Geriatric Stewardship on drug-related problems after discharge'. The Service Apotheek Poster Award was won by Tamara Imfeld-Insenegger from the University of Basle, Switzerland, with her poster on 'Evaluation of medication discrepancies identified through medication reconciliation in community pharmacy settings'. The organisation of the conference was supported by KNMP, the Royal Dutch Association for Pharmacy, SpringerNature, Pluriplus, Service Apotheken, Förderinitiative Pharmazeutische Betreuung, Zorg en Zekerheid and ZonMw. Pharmacogenomics is the study of genetic variability affecting an individual’s response to a drug. Its use allows personalized medicine and reduction in ‘trial and error’ prescribing, leading to more efficacious, safer and cost effective drug therapy. Technical developments have moved the field from reactive genotyping to a pre-emptive panel approach: in this latter approach patients are tested for a panel of genetic variants even before drug prescribing has taken place. When these data are included in a patient’s electronic medical record, this allows pharmacists and physicians to use this information at time of medication surveillance and drug prescribing. Due to its highly developed pharmacy ICT infrastructure, The Netherlands healthcare system and especially pharmacists are at the forefront of implementing pharmacogenomics into routine clinical practice. Several pharmacist initiated pharmacogenomics implementation projects both in primary and secondary care have successfully been completed. Recently, an EU Horizon2020 project Ubiquitous Pharmacogenomics (U-PGx) was funded and investigates the approach of pre-emptive panel testing using a randomized clinical trial design in 7 EU countries and including a total of 8,100 patients. Feasibility, health outcome, especially the reduction of adverse drug events, and cost-effectiveness will be studied. The U-PGx consortium ultimately aims to formulate European strategies for further improving implementation of pharmacogenomics. Various types of medication reviews are recognized, ranging from simple reviews based on the medication history available in the pharmacy to advanced, multidisciplinary reviews based on medication history, patient information and clinical information. For providing efficient and optimal pharmaceutical care, it is important to select the right patient for the right type of medication review. To guide this decision, we can focus on patient characteristics (e.g. age, adherence, beliefs), clinical characteristics (e.g. kidney function, fall risk, comorbidity), medication characteristics (e.g. high risk medication, inappropriate medication) or a combination of such characteristics. Basic principles regarding what we consider as optimal medication treatment can assist us in this process. In addition, we can make use of prediction studies to develop algorithms for distinguishing between patients with low or high complexity in need of simple or more advanced medication reviews. General principles and results from a recent study testing such an algorithm will be presented. Social media have been around for decades now and growing in various forms. The steady rise of social networking sites has, however, created a digital world which still appears to be a barrier to many. As pharmacists, it is important to be aware of the common platforms and how they may be of use in supporting practice. A wide array of these platforms are in use globally, the most common ones being Facebook, LinkedIn, Twitter, Instagram, WhatsApp and YouTube.Some platforms specifically target a business and professional audience (LinkedIn) or businesses and individuals (Facebook), while others are more news-led (Twitter) or visual (Instagram/Snapchat/YouTube). These can also be used as useful resources both individually or as a group, to inform practice as well as support education. Gaining proficiency and confidence with social media can be made easy (with the right instruction). The Royal Pharmaceutical Society GB as such has developed extensive support and guidance to help pharmacy staff to gain the knowledge and skills needed to build a strong and constructive online presence. In addition to the popular practice of connecting with friends and family, the advantages of using social media can be far reaching. It is important to understand that some of these benefits extend beyond just supporting to stay ahead professionally. One example is where the Medicines and Healthcare products Regulatory Agency (MHRA) used social media to promote the reporting of suspected side effects from over-the-counter medicines as part of a national reporting system. This became a European-wide campaign and shows the far reaching power of using social media in reaching out to audiences in different countries. Social media also enables people to promote their expertise, talk about innovative and established products and services, as well raise the profile of the profession locally, nationally and internationally. Researchers use social media to help gather data, and in some instances to recruit participants to their studies. They also provide an opportunity for pharmacy professionals to enhance their careers. Not surprisingly, many nowadays use these platforms to develop their pharmacy businesses too. Research claims that 77% of Twitter users feel more positive towards a company that responds to any of their tweets. Contrastingly, the pitfalls of using social media are not without risk. For many, commenting online may feel conversational and informal but it is, essentially, a form of publication. Careless insults or grumbles can potentially lead to a libel action or an employment tribunal. Pharmacists must adhere to the legal and ethical requirements of using social media and at the same time have the confidence to express their views. Pharmacists strive to uphold standards both in their professional practice and in their personal lives, and these must also be maintained when using social media. Robust guidelines are vital in supporting such use and ensuring ethical and legal requirements are adhered to. The short reports of the workshops can be found below. All relevant additional materials that the workshop facilitators had submitted, also can be found here. Workshop 1: Using pharmacogenetics to select patients for pharmaceutical care. In this workshop we will discuss the concept of PGx, get acquainted with guidelines for optimizing pharmacotherapy based on genotypes of pharmacogenes, dive into evidence from literature on specific gene – drug interactions, and discuss critical voices on the clinical utility and feasibility of PGx. Finally participants will develop a generic guideline on the implementation of PGx and design their own pharmacogenetics implementation approach. Every patient is different. Patients differ in age, gender, medical history, socio-economic status, ethnic background and related characteristics, such as, frailty and health literacy skills, which can lead to differences in health outcomes, (perceived) illness and use of health care services. To provide good pharmaceutical care, it is important to take the clinical as well as the personal needs of the patients into account. In this workshop we will discuss which patients need specific pharmacy services and how to identify these patients in pharmacy practice to provide tailored pharmaceutical care. Examples of such tailored care will be addressed in relation to identified target groups. Social media are a newer means of communication between people, but are hardly used in health care yet. The techniques seem quite suitable for exchange of personal notes, short movies and doing pharmaceutical care counselling activities. Some social media platforms seem more suitable for such exchanges than others. What privacy issues are involved? Which media are especially suitable for face-to-face communication? What precautions should be taken, and how can we define some guidelines and protocols? Workshop 4 : How to upgrade quality of my pharmaceutical care research design (educational workshop). The aim of this workshop is to get a qualified and peer-reviewed feedback on your own pharmaceutical care research project in order to advance the quality of research design. Participants will present their research designs of their current and/or past research projects. In-depth discussion will be stimulated in order to get a relevant feedback from the group as well as workshop-leaders. Experiences from the past research involvements will be used to understand the advantages and disadvantages as well as the feasibility of possible methodological approaches. Based on the qualified and peer-reviewed feedback the participants will aim to advance their research project designs. Workshop 5: Building concrete tools for pharmaceutical care research: development of a core outcome set and a goal attainment scale. This workshop will build on the results of previous PCNE workshops on Core Outcome Sets (in 2017 and 2018). During these former workshops, a draft protocol has been developed to define a Core Outcome Set for interventions to optimize the medication use of people discharged from hospital. The aim of the present workshop is to further develop the protocol and make clear decisions on methodology and involvement of researchers. The workshop is NOT reserved for former participants but open to all persons interested in COS and GAS at all stages of their career. During the workshop will briefly recap basics on COS and the work performed in the previous years, and open the discussion on how the outcomes, defined in the Core Outcome Set, could be measured. As an add-on to existing instruments (e.g. for the detection of hospital-related (re)admissions), the option of a Goal Attainment Scale as a person-centred alternative, will be investigated. In a 2-hour sub-workshop, Katrina Clarkson and Nina Barnett (UK) will demonstrate how GAS can be used as part of medicines-related conversations, including medication review, as an outcome measure. This will include revision of SMART goals (specific, measurable, achievable, realistic and time-constrained) in relation to GAS. Demonstration of a health coaching conversation will be provided together with an opportunity for participants to practise this technique. This will be followed by case scenarios which will include examples of using GAS goals in both rehabilitation and medicines scenarios, and a discussion of the difference between clinician identified and patient identified goals. Participants will be asked to work through the translation of a patient-stated goal into a SMART clinical goal within the GAS framework, describing the different levels of possible achievement. Each group will provide short feedback, facilitated by the workshop leaders. The submitted abstracts relate mostly to the conference themes: patient targeting and tailoring of pharmaceutical care. A few abstracts relate to other pharmaceutical care related topics such as mediciation review, drug-related problems or seamless care. The abstract submission started 14 October 2018 and ended 11 November 2018 at 24.00h sharp. Accepted abstracts shall be presented as posters or short oral communications, depending on the judgement and opinion of the scientific committee. A list of all accepted abstracts can be found below. The organising committee wishes to thank all members who contributed to the review of the abstracts. 331 Domestic internet purchasing and sources of cannabis for medicinal use within different countries: a systematic review E-health and pharmacy Medicines Use Research Group, Department of Clinical Pharmacology and Therapeutics, Faculty of Medicine and Surgery, University of Malta. The conference was be held in a seaside hotel, Hotel Zuiderduin in Egmond aan Zee, the Netherlands. Egmond is approx. 50km from Amsterdam-Schiphol, and can be reached by train and bus. For all information, please contact the PCNE office at info@pcne.org. Consultant Pharmacist, Care of Older People, Pharmacy, Northwick Park Hospital. Nina Barnett is a Consultant Pharmacist with a proven track record in both strategic an operational development relating to clinical pharmacy and clinical leadership in the area of older people. Nina has developed and delivered MSc level courses to health care professionals including care of older people and prescribing pharmacists at The School of Pharmacy University College London and Kings College London, where she is currently a Visiting Professor. She has also designed and delivered health coaching training to consultants, GPs nurses, pharmacists and other health professionals, nationally and internationally. Nina has pioneered the use of coaching in pharmacy to optimising patient adherence and is a national leader in use of health coaching for medicines-related patient care. She has devised and published work on a person-centred approach to medication review to promote medicines optimisation, management of polypharmacy and safe, effective deprescribing. Her current work includes developing, implementing and validating the award winning integrated medicines support service (HSJ awards 2015) focussing on reducing risk of preventable medicines-related readmission for older people in both hospital and primary care. Working with Kings College London she is developing methods to integrate supporting medicines adherence, polypharmacy management and deprescribing into undergraduate and postgraduate teaching, using a person-centred approach. She has recently completed a doctorate on the subject of “Developing a person-centred approach to pharmacy practice”. Katrina qualified as a Speech and Language Therapist from University College London (UCL) in 1999. She went on to complete her Masters in Neuroscience, Language and Communication, also at UCL in 2014. Since qualifying she has worked at a number of major hospitals across London within the field of adult acquired neurology. She specialises in acquired brain injury including stroke and traumatic brain injury. Katrina’s clinical experience has been split between acute services, and for the last ten years, working in post-acute and hyper-acute, in-patient, neuro rehabilitation. She has also spent time working in Sri Lanka, and supporting the SLT degree programme in Colombo. Katrina is currently working on the Regional Hyper-acute Rehabilitation Unit at Northwick Park Hospital, part of the London North West University Hospitals Trust. Multidisciplinary team working is integral to her work, together with the use of outcome measures such as Goal Attainment Scaling (GAS) and FIM+FAM on a daily basis. Additionally, her areas of professional interest are around outcome measures, service satisfaction reporting for people with aphasia, tracheostomy, and prolonged disorders of consciousness. Katrina is a visiting lecturer at Kings College London, teaching on their stroke course for nurses, as well as being a FIM+FAM lecturer and workshop facilitator both nationally and internationally. She also provides supervision and support to Speech and Language Therapists both within the department and outside of the Trust. Prof dr Petra Denig is professor of Drug Utilization Quality at the University of Groningen in The Netherlands. She is head of research of the Clinical Pharmacy and Pharmacology Department at the University Medical Center Groningen. She is also program leader of the Real world studies in PharmacoEpidemiology, -Genetics, -Economics, & -Therapy (PEGET) program. Major research aims are developing innovative strategies and insights that contribute to optimal and personalized use of medication in practice. The focus is on chronic and complex diseases, particularly cardiovascular diseases and diabetes. Petra Denig has published more than 100 peer-reviewed papers about medication use and prescribing, medication adherence, educational interventions/tools. Together with her co-workers, she has developed and evaluated educational modules, decision support tools and feedback material for practitioners and patients to optimize medication use and medication treatment outcomes in practice-based settings. This includes the development of patient selection criteria for interventions or monitoring. Petra Denig is member of several expert groups, including the Working Group Prescription Feedback of the Dutch Institute for Rational Use of Medicine and the Working Group Deprescribing for the national Multidisciplinary Guideline Polypharmacy in the Elderly. Prof. Foulon is vice-dean of the Faculty of Pharmaceutical Sciences of the KU Leuven, and former board member of Pharmaceutical Care Network Europe (PCNE). Prof. Foulon teaches communication skills, pharmacotherapy and self-medication, and coordinates different internship programs at the Leuven University. She is also promotor of master theses in Pharmaceutical Care, and is involved in postgraduate training. The research of Veerle Foulon (°1974; PharmD 1997; PhD 2001) mainly focuses on the role of the pharmacist in the rational use of drugs in the ambulatory setting (pharmaceutical care). This includes studies on the impact of collaborative practice and of (electronic) tools on patient safety and continuity in medication management. Henk-Jan Guchelaar studied Pharmacy at the Rijksuniversiteit Groningen (RuG) and specialized as a hospital pharmacist and clinical pharmacologist. Since 2003, he is employed as a clinical pharmacist and clinical pharmacologist and professor of clinical pharmacy and chair of the department of Clinical Pharmacy & Toxicology at Leiden University Medical Center. Since october 2008, he is also appointed professor of Clinical Pharmacy at the Faculty of Science, Leiden Academic Center for Drug Research, University Leiden and chair of the Leiden University focus area ‘Translational Drug Discovery and Development’. Pharmaceutical patientcare in oncology is his main area of clinical interest. He is program leader of the research program ‘Personalised Therapeutics’ investigating interindividual variability of drug response with an emphasis on pharmacogenomics. He is founder and board member of the Leiden Network for Personalised Therapeutics (www.lnpt.nl). He is (co-)author of more than 575 (Web of Science indexed) articles (Pubmed: 335) in international peer reviewed scientific journals, more than 100 articles in Dutch journals and 20 (chapters in) books. From 2010-2016 he was a member of the national Central Committee on Research Involving Human Subjects, from 2003, he is vice-chair of the Dutch Society for Clinical Pharmacology and Biopharmacy, and since 2016 he is member of the Dutch Medicines Evaluation Board. Since 2017, he is member of Council for Medical Sciences of the Royal Dutch Academy of Science. Henk-Jan is founder of the new Master of Pharmacy, Leiden University Medical Center, University of Leiden. Nejc Horvat graduated in 2007 with theme titled: “Development of a questionnaire measuring patient satisfaction with pharmacy services”. In 2014, he defended his doctoral thesis titled: “Evaluation of pharmacy services from the patient and expert perspective”. Currently, he is a member of the Chair of Social Pharmacy at University of Ljubljana, Faculty of Pharmacy, Slovenia. He is also a board member of the PCNE from 2014 onwards. His research focus is primarily the outcomes research particularly evaluation of pharmacy services, drug related problems and medication literacy. Mitja Kos is an associate professor for social pharmacy at the Faculty of Pharmacy, University of Ljubljana, Slovenia and the Head of the Chair of Social Pharmacy. From the beginning of his career he has been developing skills in several different areas including pharmacoepidemiology, pharmacoeconomics, outcomes research, clinical pharmacy and informatics. The focus of his scientific and professional activities are comparative effectiveness and cost-effectiveness of medicines, their safety and pharmacists’ cognitive services. Currently, he is a board member of PCNE and an active member of the commission at the Slovene Chamber of Pharmacies developing medication review services. He is a husband and father of three kids. Babir Malik is an author, teacher Practitioner, at the University of Bradford, Green Light Campus Northern Pre-registration Lead, Charity Ambassador for Pharmacist Support, and Law & Ethics Lead for the Royal Pharmaceutical Society Pre-registration Conferences. Babir currently practices in Weldricks Pharmacy, Scunthorpe. In June 2016, his pharmacy was awarded the "Chemist and Druggist" Medicines Optimisation Award for their innovative Local Pharmaceutical Service Intervention Service. As a Teacher Practitioner, his role includes being Respiratory Lead for the Clinical Pharmacy Community Diploma. Furthermore, Babir undertook a 10 week secondment as a Clinical Commissioning Group Pharmacist early in 2016 in North Lincolnshire. Mahendra is a Senior academic fellow and pharmacist with a national and international profile based at University of Huddersfield. He is an elected UK Board Member and most recently Treasurer for the Royal Pharmaceutical Society and the pharmacy profession. He is Honorary Senior Lecturer Medical School University of Sheffield, and Adjunct Professor of Pharmacy Wilkes University Pennsylvania USA. He iS a Fellow of NICE since 2010 and an advisory member of various panels and committees of NICE. Mahendra’s career spans community practice, health education and health promotion, academia, and research. He received the Royal Pharmaceutical Society’s prestigious Charter Award 2016 for his exceptional services in advancing the profession and promoting the interests of pharmacy. He is also one of only 15 national NIHR National Pharmacy Research Champions. Mahendra has helped pioneer student engagement in universities nationally through developing the NICE Student Champions Programme (present in medical, dental, nursing and pharmacy schools since 2011). His research interests lie in health and health inequalities within the BAME groups and medicines adherence. He has a longstanding association with the South Asian Health Foundation (formerly as their CEO), and similar relationship with the British Heart Foundation. Furthermore, Mahendra has reached out internationallys. In Lebanon, he has been appointed International Honorary Ambassador for the Lebanese pharmacy profession. Recently he has been appointed Visiting Professor in Pharmacy at the Universiti Sains Malaysia (USM) Penang Malaysia. Scientific advisor at the Royal Dutch Pharmacists Association in The Hague and Associate Professor for Pharmacy Practice Research at Leiden University. Martina is the current chairperson of PCNE. Martina studied pharmacy and economics at the ‘Technische Universität Carolo Wilhelmina’ in Braunschweig, Germany, and epidemiology at the ‘Vrije Universiteit’ in Amsterdam, the Netherlands. In 2011 she finished her PhD on pharmacogenetic interactions of coumarines at the’ Erasmus Universiteit’ in Rotterdam, the Netherlands. In 2018 she achieved a qualification in developing educational materials, tests and perform lectures and working groups at Leiden University. After having worked in several community and hospital pharmacies in Germany and the Netherlands, she is since 2002 employed at the Royal Dutch Pharmacists Association. She started to develop epidemiological tools to detect patients in need for additional pharmaceutical care and to report these outcomes to individual pharmacists and for the whole profession as quality indicators. At present she is a scientific advisor and responsible for the research policy of the association. Since 2016 she is an associate professor for Master students of Pharmacy at Leiden University. She is responsible for the teaching of epidemiology and statistics and to supervise master theses. She supervises five PhD students on measuring the quality of pharmaceutical care, pharmaceutical care in asthma patients, patient selfmanagement, side effects and pharmacoeconomic evaluations of pharmacogenetic interventions. PhD Candidate for the Ubiquitous Pharmacogenomics Consortium (U-PGx) at Leiden University Medical Center. Cathelijne studied Pharmacy, at Utrecht University in the Netherlands. Since 2016 she is pursuing a PhD in implementation of pharmacogenetics within the Ubiquitous Pharamcogenomics Consortium. 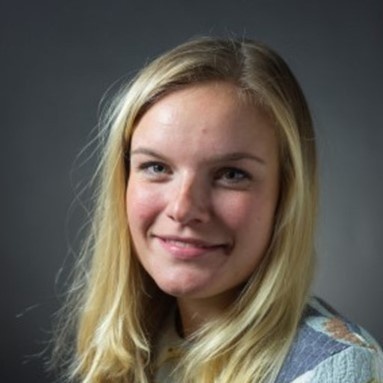 U-PGx is funded by a 15 million Euro EU Horizon 2020 grant.As part of her PhD project Cathelijne works as a coordinating researcher for an international multi-center random ized controlled trial (PREPARE, n=8,100), which is part of the Ubiquitous Pharmacogenomics Consortium. PREPARE is an investigator initiated study, recruiting in seven European countries, aiming to assess the collective clinical utility and cost-effectiveness of implementing a panel of pharmacogenomics markers to personalize pharmacotherapy. Foppe van Mil (16 July 1950) was registered community pharmacist from 1978 till 2000 in a rural area of the Netherlands. Since 2000 he is pharmacy consultant on PPR and Pharmaceutical Care. In January 2000 he concluded his PhD at the working group Social Pharmacy and Pharmacoepidemiology of the University Centre of Pharmacy in Groningen on the concept of Pharmaceutical Care. In 1985 he founded Pharma Selecta, an independent and critical Dutch drug bulletin. Between 1994 and 2002 he was member of the Committee for continuing professional education of the section Community Pharmacy of FIP. Between 1996 and 1999 he was Chairman of the Pharmaceutical Care Network Europe (PCNE), and currently he is the professional secretary of that association. He also (co-)organises the conferences for PCNE. Since 2000 he is Editor-in-Chief of the International Journal for Clinical Pharmacy. He currently teaches medication review, community pharmacy practice, and the writing and reviewing of scientific papers and abstracts in several national and international continuing education programs and conferences. Since 2012 he is a fellow of the ESCP and since 2017 he is a honorary member of PCNE.